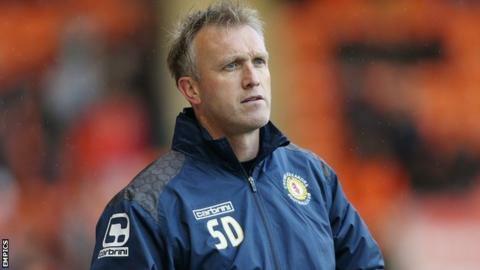 Crewe Alexandra manager Steve Davis admits some of the club's young players are struggling to cope with the demands of League One football. The Alex are bottom of the table and suffered their 10th defeat of the season at Bradford on Saturday. "They've got warriors all over the pitch and what I saw from our academy lads was concerning," Davis said. "I can't fault our commitment but there's a problem with one or two being frightened at times." Crewe, who are three points adrift of safety, have only won three times so far this term and were knocked out of the FA Cup by National League side Eastleigh. Midfielder Billy Bingham, 25, was Crewe's oldest player against Bradford in a starting XI that had an average age of 21. Three teenagers were on the bench, with midfielder Ryan Wintle making his professional debut. Striker Marcus Haber (26, international duty with Canada) and midfielder David Fox (31, injury) were unavailable. "There's a hell of a lot of youth in the group and they're looking around for a bit of help at times," Davis told BBC Radio Stoke. "It's a men's league and a lot of players are dropping down from Championship clubs alongside very good League One players - it's a real baptism for these young players." Davis, who marked four years in charge at Gresty Road on Saturday, is adamant he is still the right man to lead Crewe's attempt at avoiding relegation - even though he knows his options at the struggling club are limited. "Our age is very young and we can't be competitive in the air up front, or have the strength to occupy the centre halves because we don't have that personnel at the club. "We do with Marcus (Haber) being away and Lauri (Dalla Valle) being injured - but we've got to be a lot better."